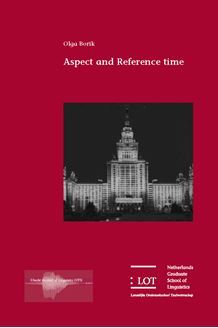 This thesis provides a theory of aspect in Russian based on the notion of Reference time. The main claim advocated in this study is that there are two types of aspect, predicational/telicity aspect and perspective or Reference time aspect. It is argued that these two types should be carefully distin­guished and analyzed in fundamentally different terms. Thus, if predica­tional aspect concerns only the properties of a predicate, the differences in perspective are captured in terms of the relation between two temporal notions, Speech time and Reference time. The analysis of perspective aspect is developed in the framework of interval semantics and is based on the the­ory of Reference time proposed by Reinhart (1986, 2000). This theory allows for the unified treatment of Reference time in tense systems and discourse analysis. On this theoretical basis, it is further argued that the aspectual dif­ferences in Russian cannot be successfully accounted for in terms of predica­tional/telicity aspect. The aspectual opposition between perfective and imperfective in Russian is, therefore, analyzed in terms of perspective or Reference time. The definitions of perfective and imperfective aspect are derived on the basis of the following empirical observation: in Russian, sen­tences with perfective verb forms cannot obtain an ‘actual present’ interpre­tation. The Reference time theory of Russian aspect maintains and formal­izes one of the basic informal intuitions about (im)perfectivity, namely, that it is described in terms of the speaker’s viewpoint. This study is of interest to researchers concerned with semantics and prag­matics of aspect and tense and to scholars interested in the issues of Slavic linguistics.